Does your smile make you happy? 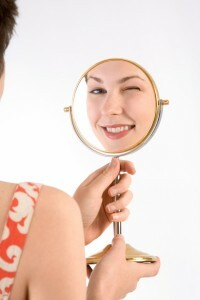 When you peer into the bathroom mirror, are you satisfied with what you see? If you're like most people, there"s probably something about the look of your teeth that"s keeping you from feeling your best. It may be a slight stain, some crooked or overlapping teeth, swollen gums, a gap, maybe a couple of chips or rough edges, or perhaps a feeling that some of your teeth are out of proportion with the rest of your mouth. Even a small imperfection can detract from an otherwise radiant smile. What would you most like to change about the way your teeth look? What change in your teeth would most improve your smile power? Prosthodontic dentist, Dr. James Courey, in Manalapan, Monmouth County New Jersey has helped many people achieve a smile that makes them happy. There are many types of cosmetic procedures and they may differ in cost, care and durability. A thorough evaluation in our office by Dr. Courey or Dr. Joseph Zagami can help you decide which type of aesthetic treatment is best for you. The assessment usually includes consultation, dental history, xrays, diagnostic impressions, and in depth oral examination. Whatever course of treatment you choose, the results will give you something to smile about every time you look in the mirror!